Europe's stunning Ryder Cup victory over the United States in Medinah helps bury the memory of their 1999 defeat in Brookline, according to Mark James. Europe came from 10-4 down to triumph 14½-13½, 13 years on from their acrimonious loss by the same scoreline. "Brookline was tainted a bit by the crowd abuse, not to mention the running on to the green at the 17th hole," said James, Europe's captain in 1999. It was a magnificent performance from the whole European team and I have never seen a more exciting end to a Ryder Cup - and I've seen plenty. "This time it's hard to see anything other than great golf under pressure." Europe led 10-6 going into the final round in Brookline, Boston, only for the hosts to win the opening six matches of the day. In the decisive match, Justin Leonard made a birdie putt on the 17th and his team-mates ran across the green in celebration despite Jose Maria Olazabal still having a putt to halve the hole. Europe's vice-captain Sam Torrance described it as "disgusting" and a bitter row ensued that - along with the heckling of Europe's players by sections of the crowd - overshadowed the result. 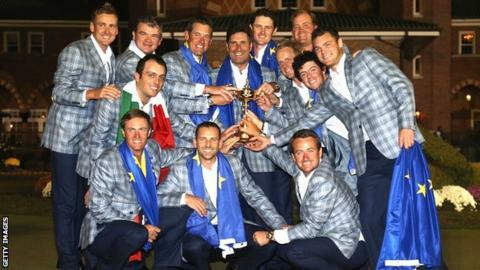 It was the biggest come-from-behind victory in Ryder Cup history until Europe matched the feat in Medinah. When asked if it was a relief that when people talk about Ryder Cup fightbacks they are likely to mention Medinah above Brookline, James told BBC Sport: "I think, yes. "The USA lost to a European team which had great momentum, great character and was determined to absolutely dig as deep as [Ian] Poulter had dug the afternoon before." James felt Europe "handled the pressure better", adding: "Next time it might not be the same but this time it was genius."